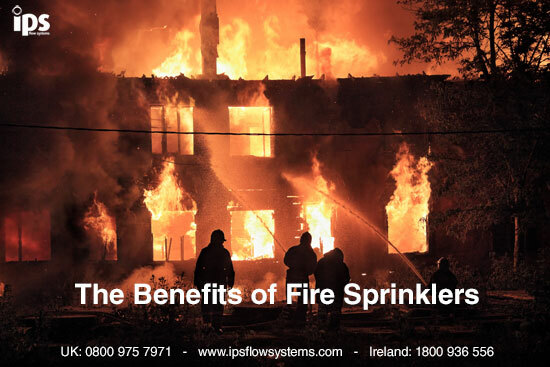 There are so many benefits to having a fire sprinkler system fitted. The most beneficial has to be the life saving benefit. This blog article provides the many benefits of having fire sprinklers installed in your home or property. Think of fire sprinklers as the equivalent to having a firefighter ready, primed and waiting in every room of your property. Not only do fire sprinkler systems provide a very high level of protection there are a number of areas in which their cost of installation can be mitigated. Here are just some of the benefits of installing fire sprinklers in your home or property. Fire sprinklers operate 24/7 giving you complete and total peace of mind. The National Fire Protection Association (NFPA) has no record of more than two deaths in a fire when the building had a functional sprinkler system in place. They offer a reduction in fire damage - fire sprinkler systems can contain and extinguish a fire in less time than it may take the Fire and Rescue Service to attend the fire. There is also reduced heat and smoke damage when the fire is extinguished at an early stage. They stop fires before they damage the property - fire sprinklers are primarily designed to save lives, but because they control fires so quickly they also significantly reduce damage to properties. They assist business continuity - a fire sprinkler system ensures a faster return to business following a fire. The fire is controlled quickly - sprinkler system in around 2 minutes, Fire and Rescue Service attendance up to 8 minutes. Plus fires in buildings with sprinkler systems have usually been suppressed before the firemen arrive. Fire sprinklers are proven to be more effective at protecting buildings than fire extinguishers and smoke alarms. Sprinklers don’t rely on people being on-hand to operate fire extinguishers or knowing what to do; people can focus on evacuating the building while the fire is automatically supressed and ultimately extinguished. Buildings protected by a fire sprinkler system are safer. Sprinkler controlled fires are less damaging than fires in non-sprinklered buildings. This usually results in insurance underwriters offering a reduced premium for properties protected by sprinklers. Sprinkler heads can be powder coated to blend in with your building’s colour scheme so that they are almost unnoticeable until they are needed. Fire sprinkler systems use less water (some 400x less) than fire and rescue services. Especially if you use a CPVC fire sprinkler system. These systems are affordable, quick to install, and offer low downtime whilst being fitted. Once installed, fire sprinkler systems are actually relatively low maintenance. They only require inspections on an annual basis. Plus the industry claims a service life of around 40 years, but it is well known that there are many sprinkler systems from the 1930s which are still operational. If you own or operate a commercial building, then the safety of the property and its occupants is of paramount importance. When you consider that there are over 100 commercial building fires in the UK every single day, getting appropriate fire protection systems in place before the worst happens is an essential. Yet despite all of the above benefits, a recent survey of over 100 businesses revealed that only 35% had any kind of fire prevention plan. Too many business owners overlook the importance of a sprinkler system and go without. You can read more about the IPS Flow Systems CPVC fire sprinkler piping range here.